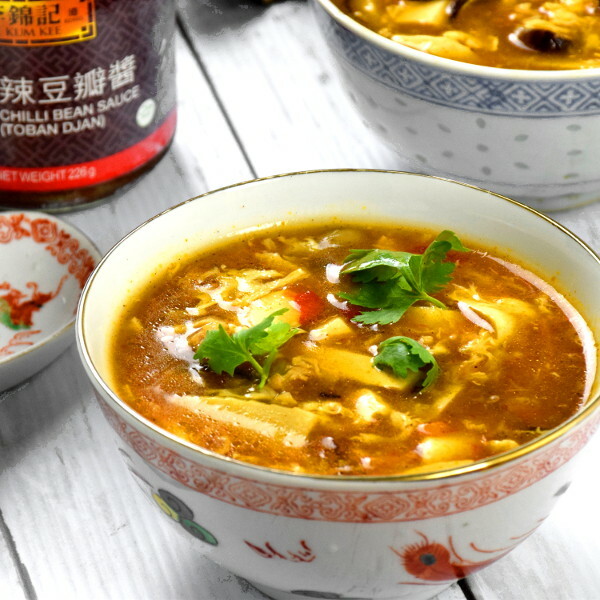 Chinese hot and sour soup 酸辣湯 is a traditional northern Chinese favorite packed with the acidity of Zhenjiang vinegar, the spiciness of the white pepper and the nuttiness of sesame oil. The flavor becomes even more complex with the inclusion of bamboo shoot, dry mushrooms, wood ear fungus and finishes with a beaten egg pour high above the soup to form multiple small egg ribbons floating on the thick soup. You only need twenty minutes to prepare it. Make it at home to warm your family (and their hearts) with this utterly delicious soup with the iconic flavors of Northern Chinese cuisine. This recipe is very close to the original hot and sour soup in Northern China, although I have left out ingredients such as ‘black tofu’ (see section 2 below) which is too exotic for most people. I can assure you that it is way better than many substandard hot and sour soup that is merely a tasteless, gloopy mess of cornstarch paste. Step one- Preparing the meat. You need some lean meat to make this soup. The meat can be either pork or chicken. Use the pork loin, and breast if it is chicken. There are two ways to prepare the meat. You can put the whole piece of meat into the boiling water and let it boil until it is cooked. Remove the pork from the pot, and keep the water as the stock for making the soup. Place the meat on the chopping board and cut it into julienne. The second method is to cut the raw meat into the julienne and marinate it with light soy sauce, oil, and cornstarch. You only need to marinate the small pieces of pork for fifteen minutes. Marination enhances the flavor of the meat, and the cornstarch can make the meat to be velvety smooth. I am using this method in my recipe. You can omit the meat for a vegetarian version. Just add more of other ingredients slightly. There are many variations of this soup. However, tofu, mushrooms, egg, and wood ear fungus can be found in almost every recipe. Here is a list of the common ingredients for this soup. 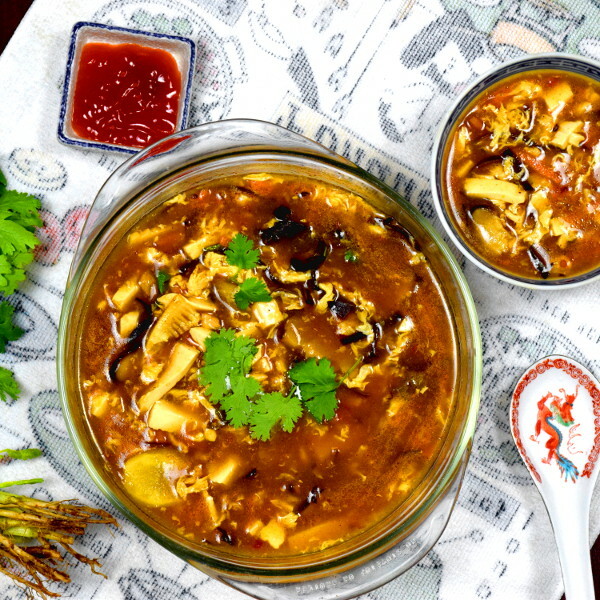 The traditional hot and sour soup recipe call for Chinese dry shiitake mushroom. Soak the mushrooms in water until it is fully hydrated and become very soft and easy to cut. The time required varies from an hour to two or three hours, as it depends on the thickness of the mushrooms. If you have enough time, soak it in advance or even overnight. (Note: they will not be ‘over-soaked’) Otherwise, soak the mushroom in hot water to speed up the process. Remove the stem, cut the mushroom into thin slices. Set aside. Tips: the water for soaking the mushrooms has loads of flavor. Use it as part of the liquid to make the soup. You can use other types of mushroom as the substitute. The best alternative is button mushrooms. Cut the mushrooms into thin slices as the dry shiitake, minus the steps of soaking it. Bamboo shoot is the essential ingredients of hot and sour soup. 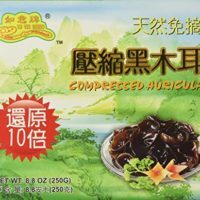 I am using the vacuum pack bamboo shoot imported from China, but I know that some places selling it in cans. You may also be able to get it online. Cut the bamboo shoot into thin slices. 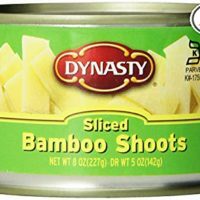 I use about two tablespoons of bamboo shoot slices. You can increase the amount if you like the crunchiness of the bamboo shoot. I remember a Chinese chef mentioned in a TV program that cut it lengthwise instead of crosswise can increase the crunchiness. Word ear fungus is an ingredient which is very Chinese. You need to soak the dry fungus with water, just like the dry shiitake mushroom. The fungus will expand in size and turn soft once it is fully hydrated. Drain and remove the hard luster in the center. Cut the wood ear fungus into fine julienne. Set aside. Wood ear fungus has a crunchy and slippery texture which is quite distinct from any other food ingredients that I ever know. The ideal tofu for this soup should be soft, but it can be difficult to handle. I usually buy the block tofu and cut it carefully into two. Then use a chef knife to it into slices and then julienne it. The trick to cut tofu by not breaking it is to use the ‘minced’ action, chopping it with an up-down action, not slicing it. Transfer the tofu strips to a plate and set aside. You should add the tofu to the soup after all the ingredients (except the egg) are cooked since it can break easily. You may also add some carrot to make the soup more colorful. Since other ingredients are julienne, the carrot is of no exception. This item is not my favorite. The name does terrify some people, even to the Chinese. So they invent a much acceptable term black tofu (黑豆腐) to avoid mentioned it directly. The closest western food I can think off is the black pudding of the staple English breakfast. It does look like a piece of tofu, which is an authentic ingredient for the traditional hot and sour soup of Northern China. If you are are looking for the most authentic hot and sour soup, go for it. Otherwise, skip it which is what most people do nowadays. Add a few slices of ginger to the soup to make the flavor. Since we only want the flavor of ginger, discard it after the cooking. The egg is another must-have ingredient for the soup. I will elaborate on how to add it to the soup in step 4. You may also want to try out the Chinese Chicken and Corn Soup on this blog. Step three- Preparing the seasonings. The sourness of the soup comes from the vinegar. 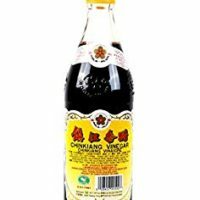 Zhenjiang vinegar 镇江醋 is best of this soup, and the close alternative will be the red vinegar 浙醋。Zhenjiang vinegar has a sharper sourness note than the red vinegar. Red vinegar is mellower than Zhenjiang vinegar and used primarily as one of the ingredients for marinade and sauces. Vinegar should only add during the final step of cooking since it will volatile and lost flavor after prolonged cooking. Add a teaspoon of sesame oil in the final step. We want the flavor of sesame. So it should never be substituted with other oils. The hotness of the soup originates from the pepper, not the chili. Ground white pepper is used for this soup by everyone, not black pepper. The white pepper will release a bitter taste if heated for too long. Add it to the soup in the final step of cooking. This sauce provides the flavor of chili pepper and the broad bean paste. It is the convenient way to add Szechuan flavor to any cuisine. Some people will skip this by adding some chili oil to the soup to provide the hotness of chili paper and create the signature red hue of the hot and sour soup. Add some light soy sauce to marinate the meat and to the soup. Soy sauce is the magic seasoning ingredient for the Chinese cooking which is high on umami. A small amount of dark soy sauce help to darken the color of the soup, You will see the familiar color of the hot and sour soup once you add the dark soy sauce and the chili bean paste into the broth. Add the cornflour slurry before, not after forming the egg drops. The corn flour will thicken the soup, and give the soup a smooth mouthfeel. Adding the right amount of cornflour slurry until you get the desired consistency. Beat the egg. Pour the egg liquid into the soup by dropping it at a high position slowly in circular motion. Wait for a second or two and use the ladle to push the egg strands around lightly. The egg strands will break into short pieces and form many small ribbons. Do not over stir the eggs. That is why I always adjust the consistency and flavor of the soup before adding the eggs. Add the Zhenjiang vinegar, white pepper and sesame oil to the soup. The three ingredients are added last as prolonged cooking can reduce the intensity of their flavor. You can now have the final adjustment of the flavor. Add more vinegar and pepper if you want a more intense flavor or some extra soy sauce for stronger umami. Turn your hot and sour soup into a savory soup noodle. 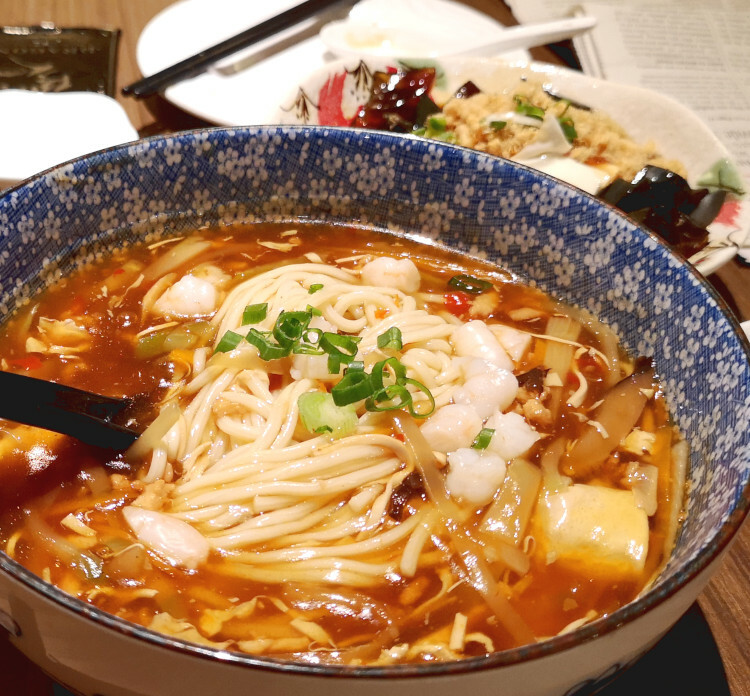 Make a twist of the easy hot and sour recipe with some added lamian (Chinese handmade noodles) for a complete meal. The noodles behave like a sponge, soaking up all the flavors from the thick soup. You can make the soup more concentrated by reducing the amount of water or increasing the seasoning (vinegar, salt bean paste, soy sauce, etc.) to take care of the dilution by the noodles. Blanch the noodles in a pot of water until the noodles are soft and al dente. You can refer to the instruction on the packaging as it varies from brand to brand. Drain the noodles and place it in a large ceramic bowl. Ladle the hot and sour soup on it and garnish with some chopped scallions. The ingredients of the soup can be varied too. Use scallop or shrimps in place of meat for the seafood version, make a chicken hot and sour soup or omit the meat if you prefer it to be vegetarian. 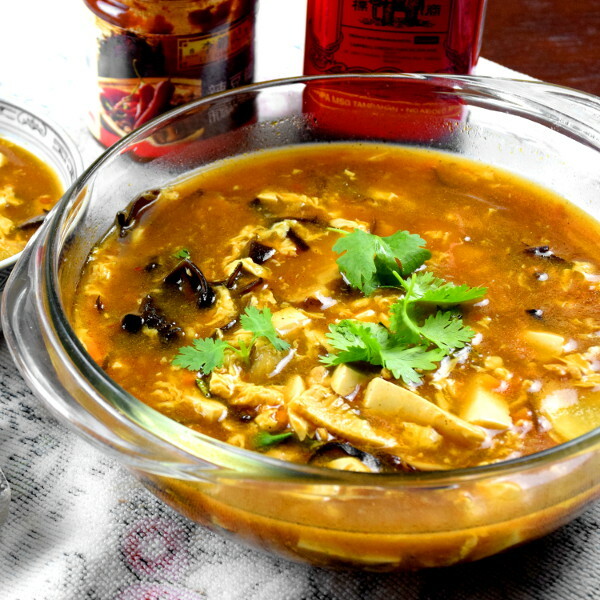 Hot and sour soup 酸辣湯 is a traditional northern Chinese favorite packed with the acidity of Zhenjiang vinegar, the spiciness of the white pepper and the nuttiness of sesame oil. Cut the pork loin into fine julienne. Marinate with the light soy sauce, vegetable oil and cornstarch for 15 minutes. Soak the dry mushrooms and wood ear fungus until they are soft and fully hydrated. Cut them into fine julienne. Cut three slices of ginger and set aside. Cut the carrots into julienne. Cut the tofu into strips. Bring the water to a boil. Cook the meat for half a minute. Then add the remaining ingredients in (B)into the pot and boil for two minutes. Thicken the soup with the cornstarch slurry. Remove from heat. Add ingredients in (E). Mix well and serve. 26 replies to "Chinese hot and sour soup 酸辣湯 – How to make in 4 simple steps"
Good explanation…big thanks for that. Thanks for dropping by. Wish you will enjoy the hot and sour soup. Thanks for following my recipes. I will continuously publish recipes from Asia. This is a very good recipe. I always use chili bean paste which is not listed in most recipes posted on the internet. 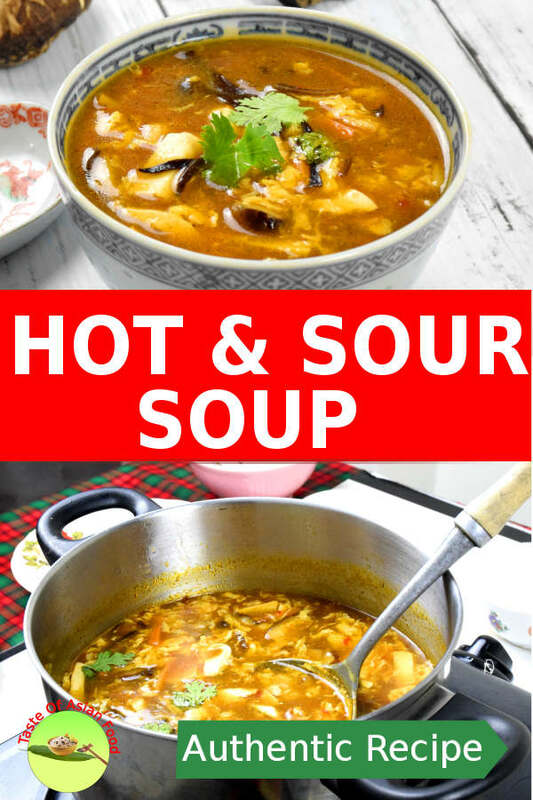 I’ve been making hot and sour soup for 42 years ever since I first had a really good bowl of it as a teenager! I never make it the same way twice! 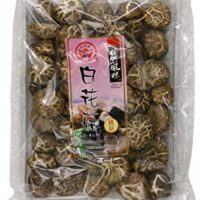 It usually depends on what I have on hand though I always have lily buds, shiitake, and black fungus. Come to think of it, I have lots of dry fungi lurking in my pantry! ;D With this last batch, I’d made a stock from bones leftover from beef roast. The broth screamed hot and sour soup! I had some leftover corn that became part of the ingredients list. I used leftover egg shreds (kinshi tamago) instead of stirring raw egg in. I also added a big glop of fermented black bean in sesame chili oil. My soup was thick enough corn starch was not needed. Being half-Japanese with a Chinese aunt and cousins through marriage, food was a lot of fun! Thanks so much for sharing! Thanks for sharing your experience in making this dish. Everyone has their favorite ways to do it. All the best in cooking. Never thought of using fermented black bean — my favorite. Thank you for your recommendation! I am not afraid of pig blood! Lol! Hi! I am a hot and soup addict and I love your recipe and description. But cab you please tell me what the pickled type vegetable is that you usually get in restaurants/take away. I think I found it in packets but it always contains MSG which I try to avoid. Thanks! Zhacai (榨菜; zhàcài) is a type of pickled Chinese mustard plant stem, used by many people in this soup. I guess that is what you are looking for. Your explanations & details are very thorough &interesting; I enjoy reading your “how to make . ..” and watching your videos. Thank you! Thank you for watching and reading. 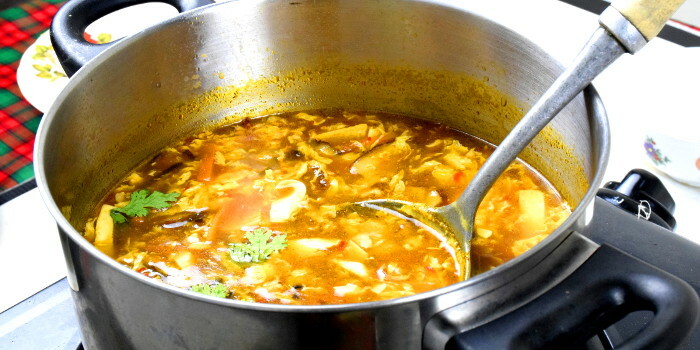 Hope you will try the hot and sour soup and other recipes here. I used to eat at a local buffet which had great hot and sour soup. I could have sworn that the julienne vegetable was pickled which added to the flavor of the soup. Is there a variation that uses pickled veg, and if so what kind? Thank you so much. I am going to make that tomorrow night. I had hot and sour soup many times in the restaurant. All the best and hope you will enjoy making the hot and sour soup. I’m in the middle of a bowl of this incredible soup and could not wait to comment. So good! The only substitution I had to make was with the pork. I had already cooked left over pork roast that I used instead of raw pork, but I think it still works. Oh, and based on the sweat forming on my brow I may have added just a dash of extra white pepper. Excellent recipe! I can’t wait to check out some of your others. Thank you! Really happy to hear from you that you like the hot and sour soup. Roast pork has better flavor and should work well. Thanks for trying the recipe. If you have dry lily buds, soak it in water until it gets hydrated. Wash and then add into the soup together with the wood fungus. Hope this works great for your hot and sour soup. OK, I’ll do like that, just one more detail. How many lily buds should I use? I will add five to ten gram of it, but it doesn’t need to be accurate.